How many are LOCAL to us? How PRIVATE are your offers? How relevant are the offers? How EASY are they to redeem? Who will employees call for help? How long are we locked in? For the business owner or HR professional charged with evaluating employee discount programs for the first time, the endeavor can be overwhelming. How do you compare programs? What are the factors you should consider? Why do some programs charge while others don’t? Which program is best suited to meet the needs and unique demographics of your workforce? 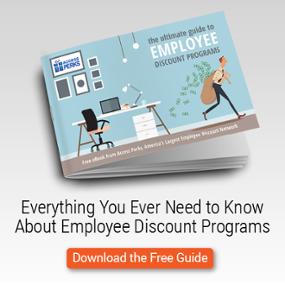 Never fear, your official guide to comparing employee discount programs is here. Be sure to ask the following questions as part of your employee discount evaluation process. Any employee discount provider worth its salt will be happy to answer them. This is where most employers start when evaluating employee discount programs. How well do I recognize the brands and, more importantly, will my employees? Look for brands with a strong national presence: stores like Costco and Target, restaurants like Olive Garden and Red Lobster, service providers like Redbox and T-Mobile, theme parks like Disneyland and Walt Disney World. Universally recognizable brands carry instant credibility, even if they’re not the ones your employees will use most often. Be aware: not every brand discounts. Providers like Walmart, Apple, and Amazon rarely use promotional offers because doing so runs contrary to their business models or they simply don’t need to. Despite its growth in popularity over the past 20 years, online purchases still represent only a fraction – less than 8 percent – of discretionary purchases made by U.S. consumers. And more than half of THOSE purchases occur through a small handful of websites like Amazon, Apple and Walmart.com, which do not discount their products. In contrast, over 90% of purchases are made outside the home at local brick-and-mortar businesses, like restaurants, department stores, auto shops, hair salons, movie theaters – just to name a few. Who are the best discount providers in the communities where your employees live? How many participating restaurants are near the office where they go to have lunch? How many retailers appear in the malls where they shop? Where in their neighborhoods can employees go to have fun, like movie theaters, theme parks, golf courses, museums, etc.? These are the places where employees spend the most money, and where the impact of your program will be the most acutely felt. Have you ever had someone tell you “you’re special,” only to discover they say the same thing to everyone they meet? That’s what it’s like offering publicly available discounts to employees and calling them benefits. These kinds of discounts are typically made available through what are called “advertising networks,” where retailers offer a small commission to websites that help them drive product sales. 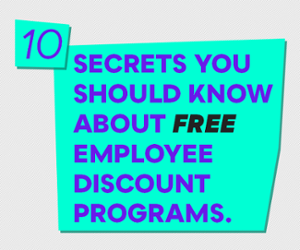 This is how some employee discount programs are able to offer their services for free. They populate their platforms with the same publicly available offers that can be found on FatWallet, Slickdeals, etc. To survive, however, they need the broadest possible audience in order to generate the greatest possible sales commission. Employers are just one of dozens of advertising channels they use to do just that. Unfortunately the result is low perceived value, low employee engagement, and the increased risks that come with positioning advertisements as a benefit to one’s workforce. What’s the average percentage discount across all offers? What percentage of your merchants offer at least one BOGO (buy one, get one) deal? How many merchants offer discounts of less than 10%? 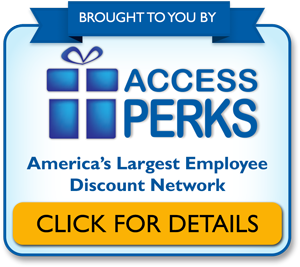 At Access Perks, for example, our average discount is right around 25%, with most merchants offering at least one BOGO offer. Virtually none of our providers offer a discount of less than 10%. Don’t get us wrong. Services like ID theft protection, tax preparation and laser eye surgery all have their place. They just don’t represent the kinds of purchases that people make every day. So discounts on such services are generally perceived as less relevant by employees (that is, at least, until they need them :-) ). Base your comparisons on how well each employee discount program covers each of these categories. Since most people eat three times a day, find out how many nearby restaurants participate in the program. Are grocery coupons available? Ask about the number, type and quality of retail stores that are available. Do they include discounts on clothing for both adults and children? How about electronics and kids’ toys? Are cell phone plans included? Dry cleaners? Movie theaters? Fitness centers? Click here to download a detailed checklist of some of the most common consumer spending categories. Use it to find out how well they’re represented in employee discount programs you evaluate. It used to be that getting a discount simply meant clipping a coupon from the newspaper and bringing it into the store. Nowadays, “promotional offers” come in lots of different shapes and sizes – some easier to redeem, and some decidedly NOT. MOBILE COUPONS. In today’s wirelessly connected world, people want to be able to save on the go. That’s why the easiest redemption method for many consumers are offers that can be redeemed simply by showing the screen on their smartphone / mobile device. The beauty of true mobile coupons is that they can be redeemed at the moment of purchase right at the cash register. Be sure to ask how many of an employee discount program’s offers can be redeemed this way and how many physical locations / storefronts they represent. The downside to online purchases, as mentioned earlier, is that they only represent a fraction of consumer purchases. In-store purchases like dining, groceries, auto care and other everyday services overwhelmingly comprise the majority of household spending. Even gift cards, which technically can be used in store, often go unused by consumers when making purchases on their own behalf. When it comes to any workplace benefit, you’re going to get questions from employees. The same holds true for even the best employee discount programs. Without dedicated customer support, the calls and questions still come. They just go to YOU. Be sure to ask: what kind of customer service can we expect for our employees? Is there someone they can call, or do they send their requests via email? If support is provided by telephone, is it provided toll-free or do we pay additional per-minute charges? If email, how often is the account checked for new submissions? What is the service department's hours of operation? 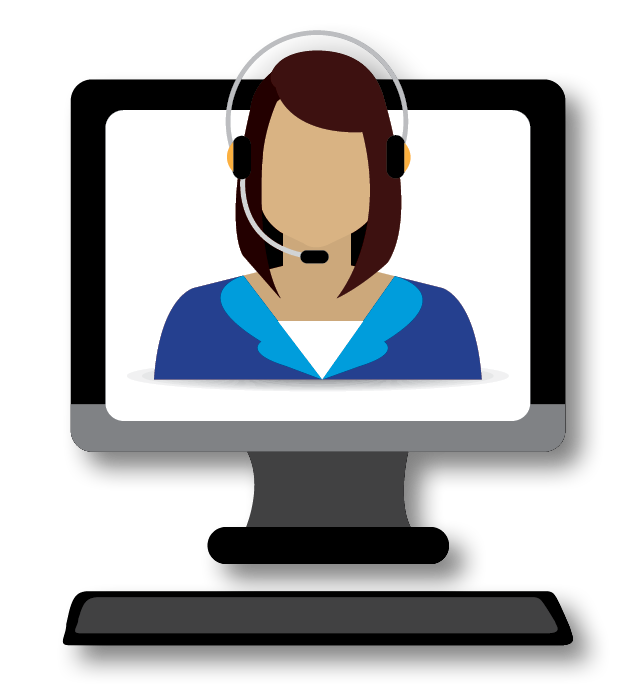 At Access Perks, for example, we include toll-free telephone service and live webchat support as a standard part of every package. The purpose is to answer questions and provide technical assistance, allowing the employers and employees we serve to remain focused on their jobs. As with most benefits, employee discount programs typically require a basic level of personal information sharing with the employer. Such information allows the program to authenticate qualified users, as well as to communicate relevant information about the benefits in a timely fashion. You need to be sure that’s all they’re doing with that data. As previously mentioned, discount programs that are, in fact, “advertising networks” generate their revenue by driving sales volume to merchant partners. The resulting pressure can lead to frequent and irrelevant “spam” email promotions sent directly to employee email boxes. Be sure to find out what your provider’s policy is as it relates to employee communications, both in terms of frequency and content. Ah! For many businesses and HR departments, this is indeed the question. Fee-based. Billed on a monthly or quarterly schedule, fee-based employee discount programs base their rates on the number of employees enrolled. Ask about volume-based price breaks as well as pricing options for basic and premium discount content. Less popular in recent years, hybrid plans are both “paid” programs in that they charge a one-time access fee and “free” in that no additional fees are paid thereafter. The access fee is most frequently charged by advertising networks to smaller employers whose size makes them otherwise unlikely to generate commissionable volume for the discount provider. Remember to ask about other costs like setup fees or charges for custom requests. These may include asking the provider to recruit businesses you refer and including discount providers you already have relationships with. Nothing lasts forever, unfortunately, and not every marriage is made in heaven. Find out from your provider the length of your contractual obligation should you decide not to continue the service. One year? Three months? One month? Does the contract renew automatically upon reaching the end of the term? If so, how many days in advance must you give notice to terminate the relationship and not be billed for the next period? Can offers be used more than once? Can the program be branded on behalf of your organization? Can you integrate discount providers with whom you already have relationships into the program? How easy is it to add and subtract employees (and are there any charges or limits on doing so)? However you choose to proceed, don’t take the decision lightly. The best employee discount programs can stretch your staff’s paychecks by hundreds, even thousands of dollars while engaging them in a benefit they can use every day. Don’t waste your employees’ time or risk their trust by giving them a program that’s nothing but advertisements. Put prospective providers to the test. Be direct with your questions. The best ones will answer them clearly, completely and openly. And when they do, you’ll not only increase your chances of finding a great program, but a great partner as well. Someone as committed to treating your employees as well as you do.